New Years History : Hello and welcome guys to this interesting site which is madbestshayari.com. Our today’s article is about a well known celebration i.e. New Year. In this article, we will discuss about How I Celebrate New Year and history, customs and preparations of this day. And guys, I want to tell you that in this site there is an availability of various types of shayari like friendship shayari, love shayari, sad shayari, romantic shayari, valentines day shayari, and many more shayari. You can easily get it from this amazing site whenever you need it. But still if you feel anything missing or mistaken you can surely let us know about it in the comment section. 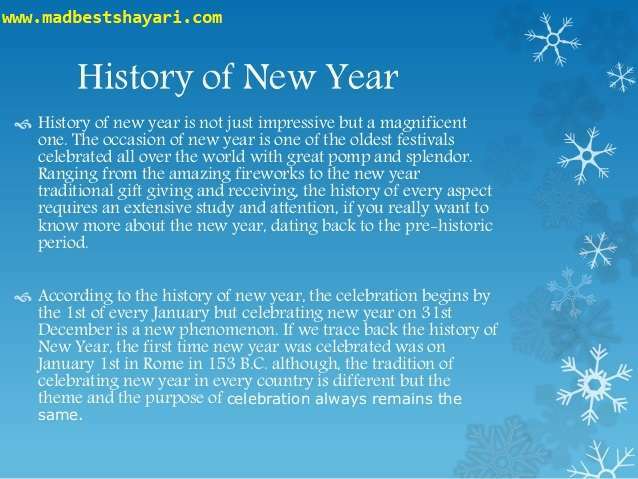 So guys let’s start our today’s article (New Years History & How I Celebrate New Year Full Explanation) in the hope that you all will appreciate it. On New Year’s day, there is a celebration on account of ending of a year & beginning of an upcoming year. It falls 7 days after Christmas on January 1, according to Gregorian calendar. It is an optional holiday for employees in private and government sector. So most of the people take holiday on this day however some go to work as well. Actually there are historical reasons behind the date of New Year. In Mesopotamia, people celebrated New Year for the first time around 2000 B.C. in mid march. But according to Roman calendar March 1, was placed at the top as the New Year & the calendar consists of 10 months from March to December. The 2nd king of Romans, king Numa establish two more months in the calendar which were January and February. These were initially placed at last but at some point these two months were considered at the beginning that’s why January 1 became New Year’s day. In China, New Year was celebrated for the beginning of Spring season. Earlier, around the time of New Year Nian, a mythical monster was trying to frighten people of nearby villages, in order to get it away from their villages people decorate their homes with lights & papers to remove darkness & bad spirit. In England, New Year was adopted officially at January 1 in the year 1752. · Jewish people traditionally eat apple & honey on the New Year day which they call it Rosh Hoshanah. · In Spain, there is a custom of eating 12 grapes at midnight as Spanish people believe that this would bring good luck for upcoming year. · In Japan, bells of Buddhist temple are rung for 108 times in order to welcome the God of New Year, Toshigami as a part of their tradition. · Greek people hang onions at the doorsteps of their house for the welfare of their children. · People of Denmark throw dishes on neighbours gates or doorstep in order to bring new friends. · In U.S., as a part of their custom people throw ball from the building for about 1 minute & it should strikes exactly at 12 midnight. Like this, many countries have their particular tradition & their way to celebrate New Year. People in Europe celebrate New Year by private fireworks. In other countries like in Canada, U.K. , U.S. , Netherland, people collect on beaches and celebrate there, which are particularly known as Polar Bear Plunges. The final match of Spengler Cup Ice Hockey Tournament is usually held on New Year day in Switzerland. In U.S. January 1 is traditional day for football games at colleges. People wear colourful outfits & greet each other, exchange gifts among their friends & relatives. And the best idea for the celebration is to attend parties & night clubs which can be public or private affairs. Many other activities like singing, dancing, playing games such as musical chair are done as a part of entertainment. People of all age groups especially youth, go to resorts movie theatre, restaurants & amusement parks while some go to holiday in order to enjoy the New Year’s day. And there are also some people who decided to celebrate New Year’s Eve at home by eating dinner with family members & enjoying by watching various TV programmes and also spending time with them. Concerts are to be organised in large cities like Mumbai, Delhi, Bangalore & Chennai in which many popular & well known Bollywood stars & other high profile personalities are present. The tradition of New Year Resolution is very famous now-a-days. Some individual make their resolutions for the coming year in order to bad habits & indulge the good one among themselves. At last, I just want to finish by saying that if you get chance to be together, whether it is with your family members or your lost friends then please don’t miss it. Have a nice day & wish you a very Happy & Prosperous New Year. For more information, keep in contact with us. Thanks guys for your precious time.